"Expulsion", but not "liberation" – this way it is correct today to evaluate the day of November 6 in the history of Ukraine, although it is not customary for the whole society. The Red Army at the cost of huge losses knocked out Germans from Kyiv. Then, in November 1943, it was not the first or even the second destructive invasion of the Bolsheviks into the Ukrainian capital. The first was made possible by the Bolshevik coup. It is the term "coup", and not "revolution," that is correct to use today, when one remembers the centenary of the seizure of power in Russian Petrograd. A hundred years ago, Ukraine also experienced its own revolution. It is significant that the Ukrainian People's Republic, the first national-democratic state, was formed not on the whole territory of modern Ukraine, but only where the Russian Empire until recently had been dominated. The state was proclaimed on the wave of a genuine democratic revolution in Russia itself, which the Ukrainian bourgeoisie welcomed. And, what is noteworthy and what should not be forgotten, by November 7, 1917, political and economic independence from the new Russia in Kyiv was not discussed. First of all, it was about cultural independence and the opportunity to develop the language, to create, as they say now, a national cultural product. On the political plane, they talked only about the Ukrainian national, if you want, ethnographic autonomy while maintaining ties with Russia and even agreeing with certain political decisions of Petrograd, then its capital. Again we will have to turn to the modern terminology that is understandable for us to explain: by November 7, Ukraine was considered by the leaders of the Ukrainian Republic and the Russian Provisional Government as something like a federal district. Not a colony, but not as the own state with appropriate borders as well. Uncertainty collapsed at one point, figuratively speaking, with the volley from Aurora. 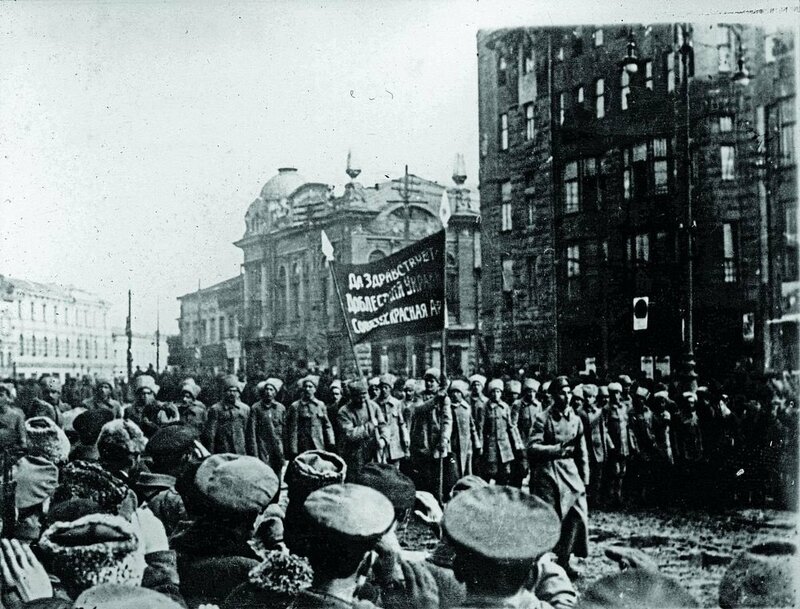 On the night of November 7 to 8, 1917, the Bolsheviks seized power. The very next day the Central Rada rejected all doubts and proclaimed, finally, the state independence of the UPR with a clearly defined territory. The leader of the Russian Bolsheviks, Vladimir Lenin, was enraged because of this. The Petrograd Soviet of People's Commissars headed by him failed to influence the elections in the All-Ukrainian Constituent Assembly. The pro-Ukrainian forces, regardless of political orientation, took more than two-thirds of the vote there, leaving the proletariat on margins. After that, the new Russian "revolutionary" government, in fact, the rebels took a course toward military aggression against a rebellious and independent neighbor. It is important not to forget the dates. So, on November 7, the Bolsheviks-Communists and Socialists together seized power in Russia, which only half a year studied and tried to implement European democracy. Anyone who is studying something – he makes mistakes. The mistake of a weak democracy was a frivolous attitude toward aggressive and destructive marginals, such as the Bolshevik Marxists. Having shown strength, the Bolsheviks on November 12 are trying to intervene in the elections of the neighboring UPR. That is, it took only four days - and Russia is already interfering in other people's affairs. A month later, with the support of Petrograd, an illegitimate Soviet government was created in Kharkiv, which was called the "People's Republic." A further Russian military invasion was already taking place under the slogans of protecting the Ukrainian proletariat. Until recently, such things in Ukraine did not receive attention as important ones. But given that the situation happened hundred years ago was repeated literally… And fortunately, Kyiv is not being bombed by direct fire from Russian guns, as in January 1918. This was the first occupation of Kyiv, which brought a daily bloody terror. Thus, the first thing that Soviet Russia did as a newly formed power – it attacked Ukraine in order to seize and appease. So it is correct to remember November 7 as a century from the beginning of Russian aggression against our state.